A team had to serve at least one year as a club team in order to give reasonable expectation that it could succeed if given varsity status. There must be sufficient intercollegiate competition available within the State of Virginia and the ACC area in order to develop a schedule. There must be facilities available at the University which would enable the prospective team to function and succeed. The first women's club teams to begin competition in the fall of 1971 were tennis, field hockey and basketball. These teams were accorded varsity status for the 1973-74 session. At this time, it was also decided that all women's intercollegiate teams would be afforded the same opportunities for travel and scheduling equipment as the men's non-revenue teams, excluding football and men's basketball. It is worth noting that there were no athletic grants-in-aid offered for men's non-revenue sports in 1972. Photograph of Mary Slaughter. No date Photograph by Ralph Thompson. Courtesy of the University of Virginia Alumni Association. Mary Slaughter was the first woman to letter in any sport at the University of Virginia and the first to participate officially for a Virginia athletic team--in 1954. The United States Lawn Tennis Association crowned her the Virginia State Women's Champion in 1959, 1961, and 1963. 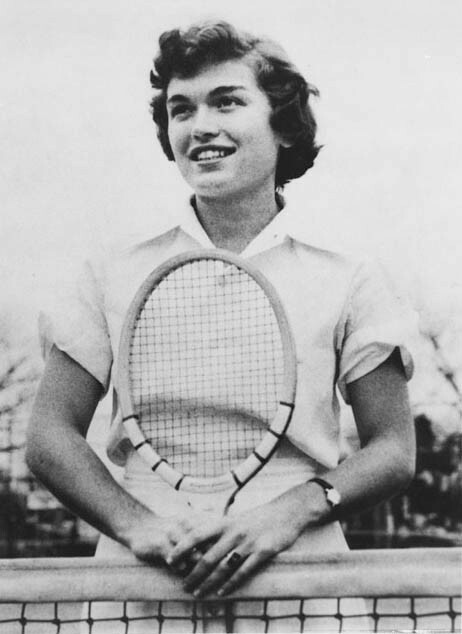 This Middle-Atlantic netter continued her illustrious tennis career in Illinois in 1965 when she became a teacher at the University of Illinois. Photograph of Margaret Groos. 1981. Photograph from the 1981 Corks & Curls. 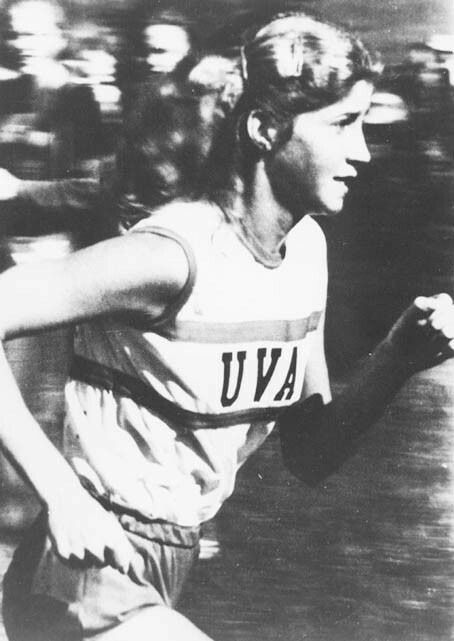 The first woman to receive an athletic grant-in-aid at UVa, Margaret Groos' dedication as a runner was unparalleled. She was an inspiration to all athletes at Virginia because of the rigorous training regimen she put herself through in and out of season. This strong personal commitment enabled her to set records in every distance event, from the 1,500-meter to the 10,000-meter, five of which still stand today. An alternate in the 1984 Olympic games, she succeeded in winning the marathon in the 1988 Olympic trials. Photograph from the 1981 Corks & Curls. Photograph of Valerie Ackerman (#25). 1981 January 7. Photograph by Caren Linman. A recipient of numerous awards on and off the court, Val Ackerman's most recent honor is being inducted into the GTE Academic All-American Hall of Fame. Upon graduation in 1981, this four-year starter and two-time all-American, went on to play professional basketball in France for one year before continuing her education at UCLA and receiving her law degree in 1985. Presently she is president of the WNBA. Photograph of Susie Williams. No date. 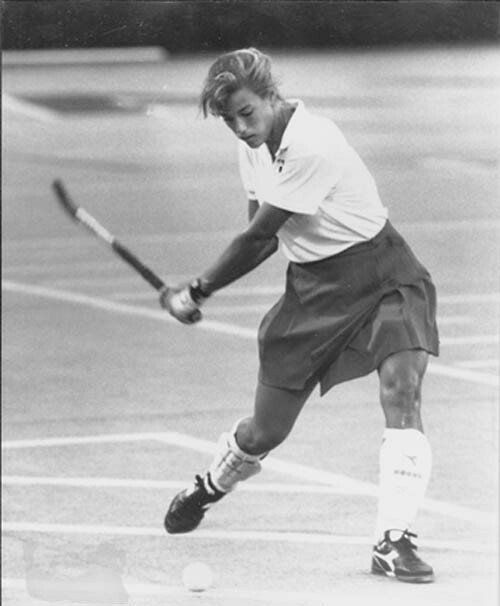 Hailing from one of the most famous lacrosse families in the game, Susie Williams graced our fields and enjoyed great success here in both lacrosse and field hockey. Entrenched in the game of lacrosse, she was convinced to stay on to coach for two years following graduation. Williams was an assistant coach in 1991 when Virginia's women lacrosse team won their first National Championship. Photograph of Heidi and Heather Burge. 1991. Photograph by Jim Carpenter. Courtesy of the University of Virginia Athletic Department. 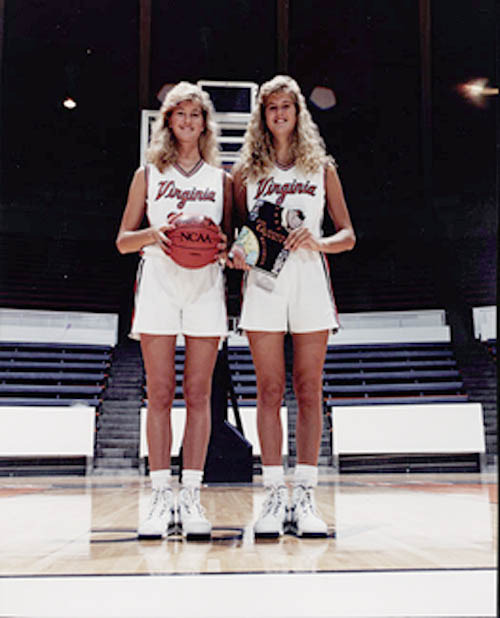 Virginia's own twin-towers, Heidi and Heather Burge, thrilled women's hoops fans and gave the Virginia Lady Cavaliers a dimension they never had before or since. The Burges helped lead UVa to three ACC championships and three NCAA final four appearances before graduating in 1993. Heather has since pursued a professional basketball career overseas with a possibility of playing in the WNBA this coming year. And, in addition to playing for the Washington Mystics, Heidi is presently working hard on the "Heidi's Hoops for Hope" Foundation, a non-profit organization promoting basketball for inner-city girls in the D.C. area. 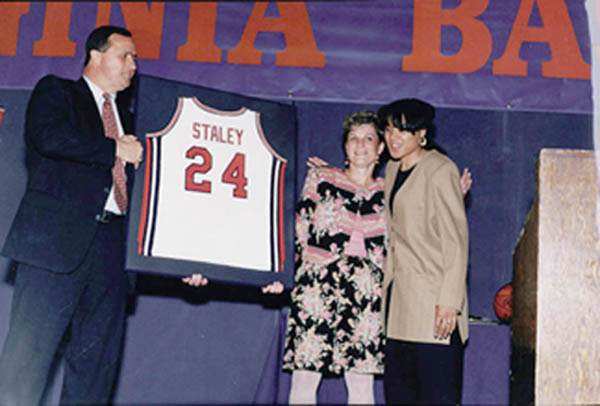 Photograph of Dawn Staley, in tan jacket, with Jim Copeland, UVa Athletic Director, and Debbie Ryan, Women's Basketball Coach. 1993. Photograph by David L. Greene. Courtesy of the University of Virginia Athletic Department. The most talented and dominant female player ever to grace the hardwood in Charlottesville, Dawn Staley set a standard against which all future Virginia women's basketball players will be judged. During her collegiate career, Staley helped Virginia to a 110-21 record, earning her three Kodak All-America nominations in the process. 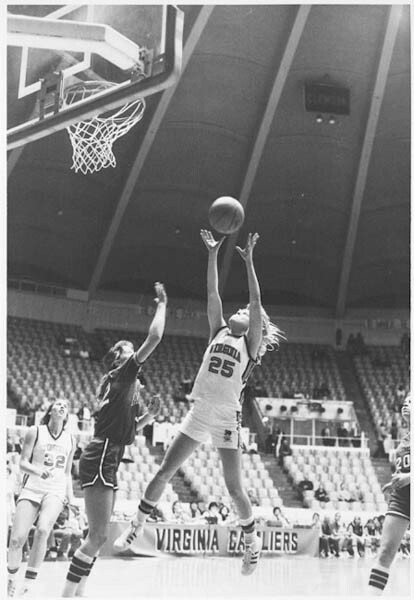 Graduating in 1992 as a two-time national player of the year, she still ranks as Virginia's all-time leader in points scored (2,135), scoring average (16.3 points per game), and assists (735). After college, she dazzled fans across America with her ball-handling skills as she led the U.S. National Team to win a gold medal in the 1996 Atlanta Olympic games. An inaugural member of the non-defunct American Basketball League, Dawn Staley will display her abilities in the WNBA next year.